I am so not ready for the holiday. I am normally ready by now and excited for the holiday. This year I feel so unprepared. Do you have a last minute gift you need to buy for a child? Think Peppa Pig. There are so many great Peppa products out there you can’t go wrong. I have the honor of reviewing the Peppa Pig Picnic Adventure Car. We first learned about Peppa Pig from my in-laws. They are from England and that is where Peppa Pig was born. 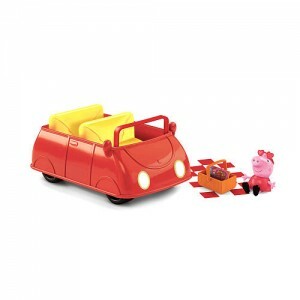 the Picnic car come with a mini Peppa, a picnic basket and blanket, and of course, the pig car. Here is a cute little 5 minute video of a Peppa picnic episode. Cooper really enjoyed the car. He made sure Peppa didn’t have a picnic alone either. There was room in his car for Iron Man, and some army men. He said they kept Peppa’s food safe from any ants that might be thinking of invading. I really like the Peppa products because I know they are good quality products. The car it’s some cheap piece of plastic. It’s the type that will survive many basement step accidents. Mom’s you know what I mean, why they “accidentally” drive the car down the steps to see what cool moves it can make. I had the privilege of also reviewing in the past Peppa Bedtime & Bathtime as well as other Peppa products. The Peppa Pig figures, books, and DVD’s all make great gifts as well as stocking stuffers. So if you in a jam and don’t know what to get, think Peppa!